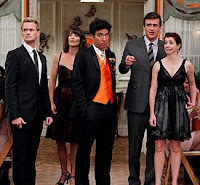 Charles B. French Official Site: How I Met Your Mother: "The Lighthouse"
Full Review: Yes, the plot between Robin and Barney's mom was sweet, as was the flashback when Robin told Barney she can't have kids. I did like how the show resolved the tension between Robin and Loretta, giving us a very sweet moment between them. My issue with the show isn't with that big moment, it's with the even bigger moment: Ted's proposal on the lighthouse. Now, I'm a fan of simple and sweet proposals at memorable locations. It makes sense Ted would propose at the lighthouse, as that's the place that allowed him to meet The Mother. Plus, I'm glad we got to see this moment, as we've been lacking The Mother for quite a few episodes now. However, this is Ted we're talking about. Ted, the man who delivered a pizza to Marshall while he was driving through Chicago. Ted, who crafted a two-minute date with Stella. Ted, who spent a day creating a light show to make Robin feel better. Ted of the Superdate. He couldn't have gone all out in his proposal? Now, there are two reasons why it was a simple proposal. One, Ted has learned that those kind of elaborate theatrics aren't better than the simple and genuine. Or two, the show spent too much time on filler and only gave Ted and The Mother a few minutes. Sadly, I feel the second option is most likely correct. This show has missed a few opportunities to give us a better look at Ted's relationship with his future wife, and I'm starting to get annoyed. The reason I liked the idea of extending the entire weekend for a season is that it gives us more opportunity for character depth. However, this show has a habit of short-changing meaningful plots to make room for filler, and this episode is a prime example. A proposal is a big, momentous occasion in a show, and this entire series is centered around Ted meeting that woman. Why wasn't this episode more about that proposal? The other storylines weren't unimportant, but they could have easily been pared down or moved to another episode to make room for the buildup to Ted's proposal. Look back last season to Barney's proposal to Robin. The show spent several episodes building up to that moment, and when Robin picked up that sheet of paper, we were treated to a long, extended flashback sequence that showed what was really happening, and how Barney spent weeks of effort getting Robin to that rooftop. We couldn't get that with Ted? He's the main character of the show, and while the series is building up to the moment he meets The Mother, can we get a little more buildup to him proposing to her? Having him carry a woman on his back up the lighthouse steps, then throwing up, is not enough buildup. I want to see Ted the incurable romantic, Ted the meticulous planner. Ted in the present talking about what he'd love to do when he finally meets a girl worth proposing to. So that's my problem with this episode. It just expected the proposal to be meaningful to the viewers but gave us very little reason to emotionally invest in that moment. It wasted a very big opportunity to show why Ted is an awesome guy, and we wasted it on a lot of meaningless scenes. Biggest Question: How are Lily's hands not bleeding? Best Sagat Narration: "And kids, as I stood on that lighthouse and looked at that girl, I felt something happen inside me, something that had only happened one other time in my entire adult life."